Running with Soldiers at SAFRA Singapore Bay Run and Army Half Marathon 2017 | JustRunLah! That basically was what it was, I realized – a race running with soldiers. 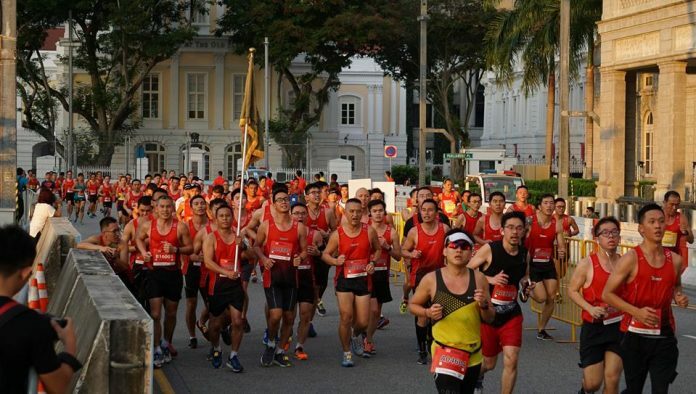 SAFRA Singapore Bay Run and Army Half Marathon was into its 25th edition and SAFRA was commemorating 50th year of NS too. The entry fee started at $9 for the 5 km fun run, $12 for the 10 km and $16 for the half marathon, if you are NSmen. There was also the NS50 team run and the family for lives (800m) challenge. 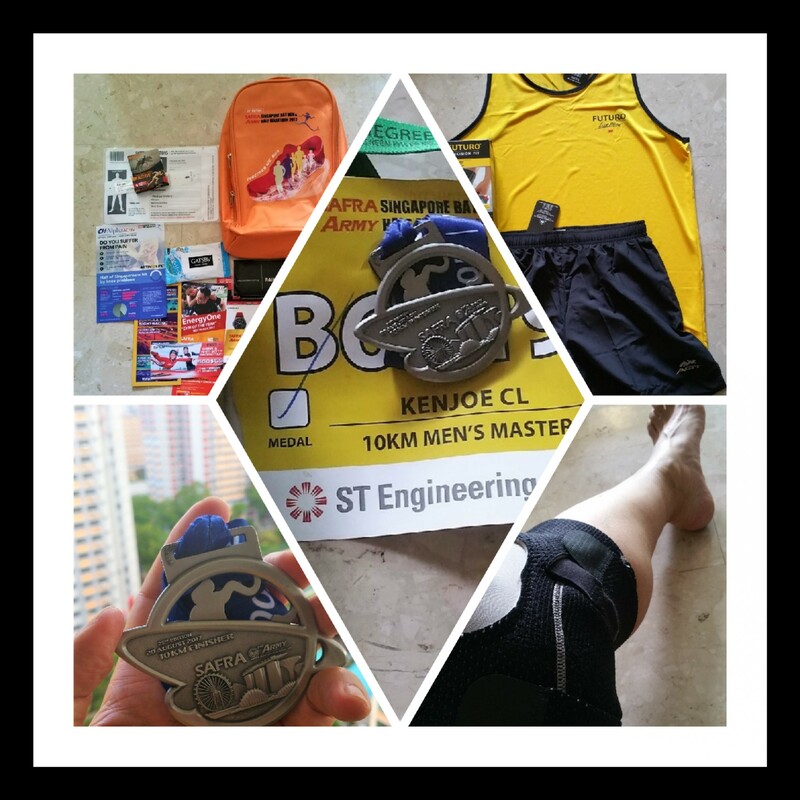 I would have dived in to sign up for the 21.1 km if not for two reasons, that I’m wary of aggravating my back injury (see my old posts) and that I was still apprehensive about the massive jam that I experienced in the half marathon last year. Anyway, as luck would have it, I also managed to get a free ticket by running with Futuro. It was a last minute inclusion as my friend SY sent me an email from the sponsor. I read the email late and after an initial rejection, I was later accepted. I chose the 10 km race. I therefore collected my race pack from 3M(Futuro) on the following Monday after the normal racepack collection date and received some additional items minus the official tee. Race day was another fine morning. It didn’t rain. And it was not too hot to start with. I have to reach by 6.15 am so that we could take the photos first before the official start at 6.30 am. I thought it was a bit too close to the starting time so I planned to get there before 6.15 am. I managed to get there but the crowd was massive and for some reasons I didn’t see anyone in same outfit near the venue. I moved with the massive crowd to the start line, thinking I must have somehow missed it. I would take my own photos later and tagged as required. I inched forward towards the front as I saw the sea of red. The DJ was doing the usual encouraging intro and getting the crowd ready. After a few more minutes, it was flagged off. Then we were stopped because we would have to be in wave 2. After about 6 minutes or so, we were flagged off too. I ran. All around me, I saw mostly young crew cut heads. First km was soon completed, and glancing at the Garmin watch, I was shocked I was doing 5 plus min pace. This was way too fast vs my usual time – 7 min. Slow down… Second km seemed to flash by. Another 5 min plus pace somehow. Then the hydration stop. But I wasn’t thirsty so I skipped. Except that the bottleneck had started. Couldn’t run. Just moved a step at a time. I was engulfed in an army of runners literally. A thought occurred to me then. Envied these young men. They are young soldiers mostly and have the opportunity to take part in such events – my times, practically nobody really talked about running races like this event. No, this started 25 years ago, so it was non-existent for me during my NS time. Really ‘lao peng’ – old soldier. And so that kind of run,stop, run characterized the rest of the journey in certain tight spots. There was even a flight of stairs up and run for a short stretch, then another flight of stairs down. Still, I wasn’t panting but I didn’t enjoy the ‘transition’. After a while I settled into my usual 7 min plus pace and skipped another hydration stop because there were just too many people. I stopped at the hydration station only once as a result. My Garmin showed that the mileage marker was about 500-600 m off consistently so I guessed I was going to do 10.5 km or so instead of 10 km and that further reinforced the thought that a PB was off the radar despite the fast first two km. Weather was cool and the surroundings were familiar to other races that started off near the Esplanade. One most scenic point was when we saw the heads of the famous otter family bobbing in the waters on our right side. A few stopped to take photos too. Soon I could see the finishing line and found myself still having enough energy to pick up some pace. 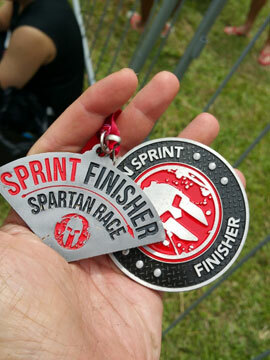 Grabbed a couple of the 100-plus and skipped the banana and collected the medal. After strolling around and seeing the endless group of runners coming in, I decided to go back. No chance of spotting any of my friends and perhaps they have already gone back too. A nice morning race despite the jams. It was reported that 41000 runners took part in the whole event, so it was a successful event despite the crowds. Took some photos after the event and tagged #RunningwithFuturo too. 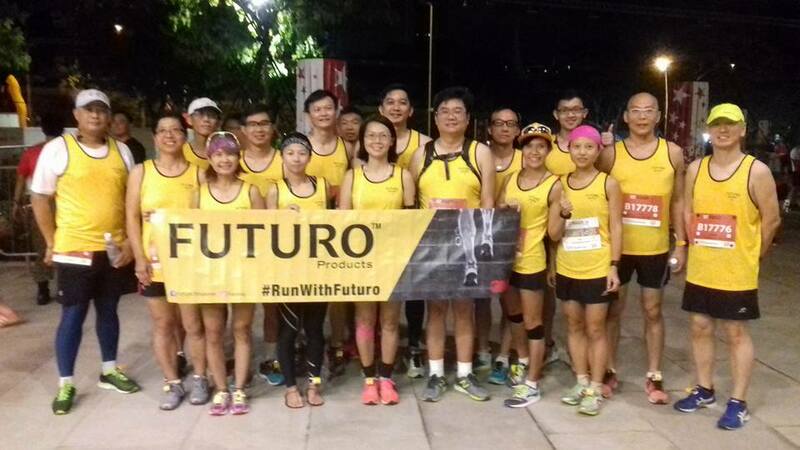 A pleasant experience to be sponsored and glad to be able to support Futuro products as I had used it before too, in the past. So thank you, Futuro for the opportunity. And a bit of nostalgic reminder of NS times. 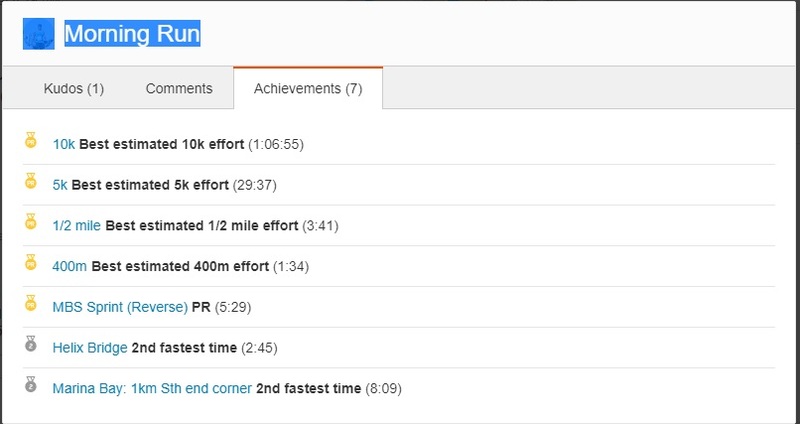 Was surprised too to find that I’ve achieved a few records based on Strava apps (2016-17). Been a long time since my current injury that I’ve done sub-7 min pace for 10 km distance. Maybe this is my way of a Salute too to all NSMen for their contributions for past 50 years – to run and sweat it out together in this event. So sometimes you reap your rewards later at an unexpected time. The important thing is to believe and keep on going even if sometimes things look tougher at each turn in life. As I always say, running resembles life – there’s always ups and down, regardless of your age and station in life. Run Happy, Run Safe.